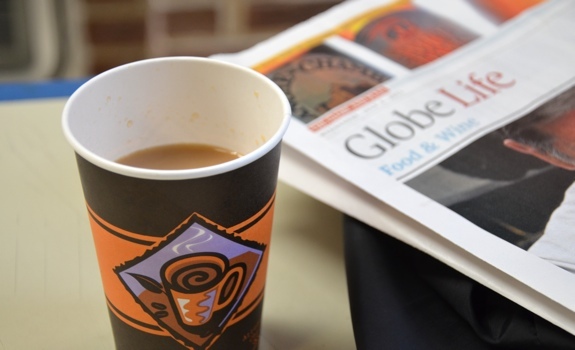 Generally, when I think of enjoying coffee and the copy of the Globe, this isn't the coffee I have in mind. 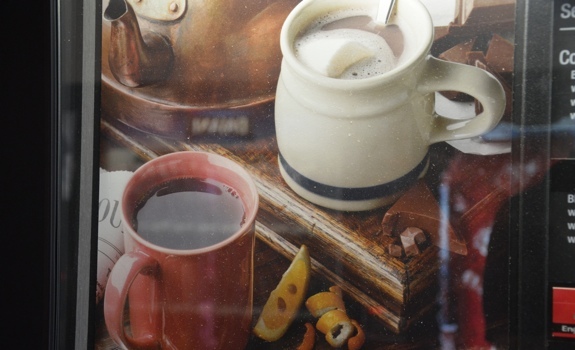 Who doesn’t remember the coffee vending machine at the skating rink or swimming pool, serving up mediocre hot beverages for parents to sip on while passing the time with the newspaper, waiting for little Betty to finish hockey/swimming lessons. In the last few decades, I’d like to think coffee tastes have improved more than a little bit. Starbucks has made strong dark-roasted coffee a normal part of city living, and little independent cafes have helped educate the public on what a good cup of coffee should taste like. And yet, in 2011, it still doesn’t take much digging to find one of the last bastions of old-school, pre-café-revolution coffee culture. Wow. That coffee sure looks pretty, doesn't it? And that's TOTALLY what the stuff this machine churns out looks like, right? Right?? The Look: The machine I bought my coffee from was surprisingly modern by coffee machine standards. Older machines are still kicking around, with their mid-70s vintage glowing lights and analogue push buttons. The graphics and typefaces on those puppies are stunning. 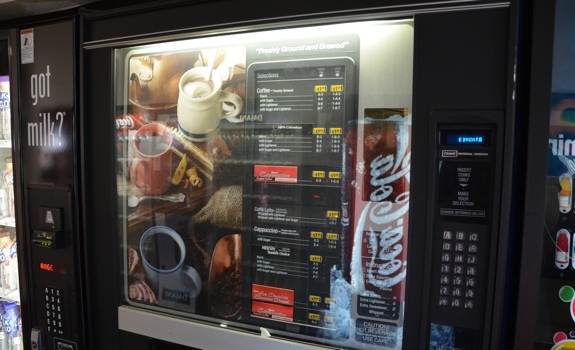 The machine in the U of A’s business building was depressingly clinical, with a faded image of studio-lit, romanticised cups of coffee that the machine would clearly be unable to produce. 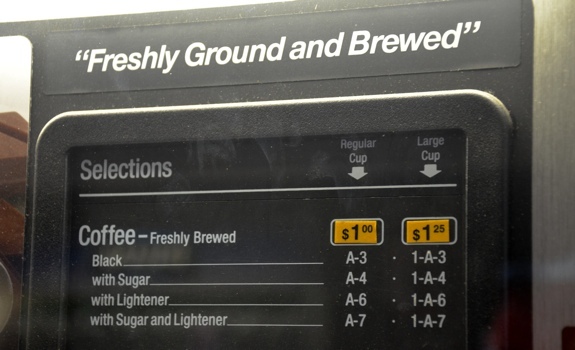 The Pitch: “Freshly Ground and Brewed.” Really? Hunh. How ’bout that. Freshly ground and brewed? Really? That's one hell of a claim, considering what this stuff tastes like. The Method: Look at the list of coffees with optional add ons. Insert coin(s). Punch in the corresponding number (my coffee was an A-7 – “Coffee – Freshly Brewed with Sugar and Lightener”). 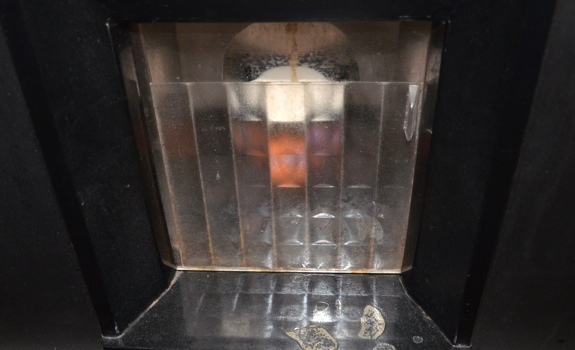 Watch as a tiny cup drops onto a drip tray behind a clear plastic barrier. Wait while the machine whirs and does its thing. Note the stream of coffee being dispensed into the tiny cup. When it stops pouring and the plastic barrier slides open, wonder if the machine deliberately short-changed you by only filling the cup 3/4 full. 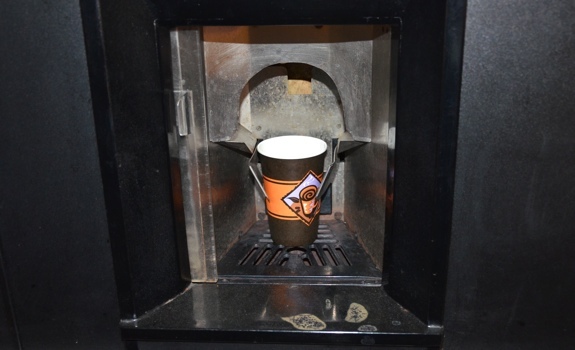 Take cup, sip, and curse the engineers who built this contraption. Behind that grubby plastic shield is a cup of coffee being dispensed. Behold: Technology! The Taste: Terrible. No, really. About as watery as a cup of coffee can get, dosed with a good quantity of sugar and a hit of artificial creamer. That’s about all you can taste. At least the quantity served is mercifully small. Make no mistake – this coffee is, as @KarenUnland would likely put it, a caffeine delivery system. And even then, given the watery strength, you’re not going to get much buzz out of a cup of this stuff. The reveal! The reveal! Wow! It's ... it's ... a tiny, 3/4 full cup of coffee? I guess so, yeah. The Experience: I find vending machines fascinating, and ones that actually make something, instead of dispensing a pre-made bag or a can, even more awe-inspiring. And yet the resulting coffee is awful, there’s no friendly chit-chat with a barista, and it feels like you’ve somehow just participated in the most base of feeding rituals. The machine I purchased my coffee from. Sorry about the reflections. 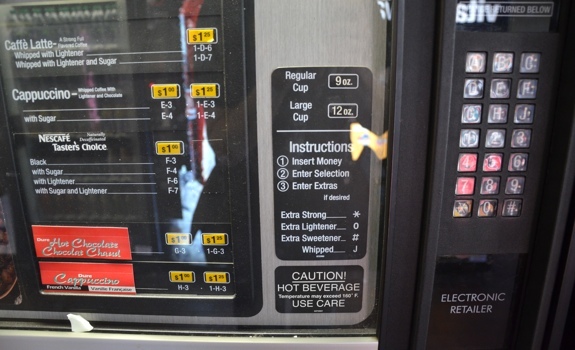 I was a bit self conscious about, you know, taking pictures of a coffee vending machine. Value for cash money: Cheap unit cost, but still not a good value. Availability: Check the vending machine areas on a university campus near you. The verdict: What was I expecting? Not much. What did I get? A teeny-tiny cup of not much. This selection pad is positively space-aged compared to the coffee machines I grew up with.